Outdoor Furniture Powder Coating in Syracuse and Central New York. Rick’s Wheels is not just about wheels and rims. We also love the outdoors. And that means outdoor patio and garden furniture. With powder coating, you can restore your favorite patio furniture, metal railings and metal gates and save the cost and hassle of shopping for new. Syracuse and Central New York weather can be pretty harsh, particularly when you have to leave your patio tables, chairs and furniture exposed to the elements year around. 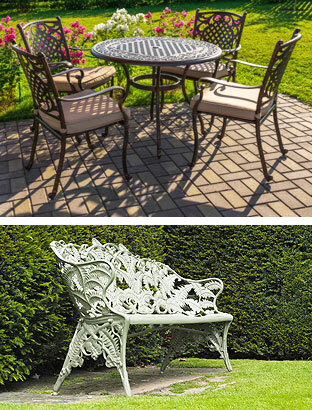 We are specialists in outdoor furniture powder coating and refinishing. Whether you are building a brand new deck or patio or giving your existing deck a fresh makeover, we can help you make them a reality and restore your patio tables, chairs and equipment to a better than new appearance that is durable, beautiful, and will stay looking that way for years to come. If you’ve got metal outdoor furniture, lighting fixtures and accessories you just can’t bear to part with, give us a call. We’ll show you how easy and affordable it is to give them a great new custom powder coated refinish in your favorite colors. Then you can sit back and relax, and enjoy that beautiful new look for years to come. Adding color and texture is one of the easiest and most economical ways to add value to your property. With powder coating you can restore those old rusted porch railings, driveway gates, and metal fences and enhance the beauty and appearance of your property for years to come with a functional, durable, weather resistant powder coated finish in the color of your choice. 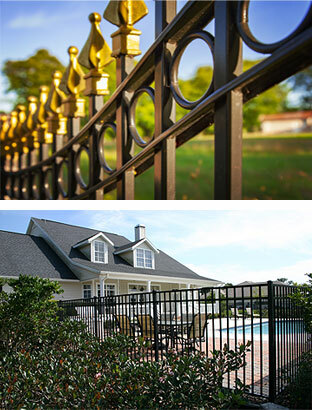 Powder coating fences, gates and railing provides maximum corrosion resistance, both in residential as well as marine and architectural settings. Whether your needs are residential, commercial, architectural, or industrial, powder coating guarantees years of corrosion, weather and scratch resistant functionality. We are proud to offer a complete line of powder coating solutions for all your metal installation and restoration projects. From entry gates to decorative and functional swimming pool fences, children’s swing sets, lighting fixtures, balcony railings, and more, Rick’s Wheels can handle make sure your project turns out beautifully. FREE ESTIMATE. REQUEST A QUOTE.